Touch or wheel and never the twain shall meet. That used to be the way of things for in-car interfaces. You knew where you were. But now BMW has added touch control to its wheel-driven BMW iDrive platform, and we've lost the power of rational thought. In fact, Audi has had a touchpad-and-wheel MMI controller combo available on certain models for about a year. So, this isn't a dramatic world first. But BMW has taken this a step further than we've seen before. 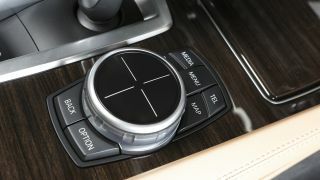 Instead of a separate wheel and touchpad, BMW has stuck the pad right on top of the iDrive wheel. Measuring 45mm across, the touchpad isn't just for inputting characters. It also supports gestures such as pinch-to-zoom when viewing maps, and will include cursor control in a future update. Given BMW's distinctly Apple-esque adherence to the purity of wheel input for iDrive to date, it's an intriguing update. In an ideal world, it'll offer the best of both worlds – wheel input and touchscreen – without the downsides of the latter, which always makes for mucky screens and sometimes involves reduced screen quality and patchy responsiveness. Meanwhile, iDrive Touch isn't the only infotainment upgrade that debuts with the 7 Series. New high-contrast graphics with added 3D effects, and transparencies for iDrive and even more detailed 3D graphics for the maps are also part of the mix. Cue much rejoicing. Finally, LTE cellular modems with Wi-Fi hotspots will also be offered, which is great if you have LTE in your country. And rather academic if, like the UK, you're still waiting for the mobile networks to get their acts together. iDrive Touch rolls out first on the freshly-revised 7 Series limo later this year before trickling down to more mainstream models.